In 2008, Konono Nº1 won a Grammy Award for their 2007 album Live At Couleur Café. It was released on Crammed Discs, and was the third album Konono Nº1 had released since producer Vincent Kenis rediscovered the group just a few years earlier. By then, Konono Nº1 were already approaching veteran status. formed in Kinshasa, in the Republic Of Congo in 1966 by Mingiedi Mawangu. He was an talented musician, with aspirations of making a living out of music. That however, seemed like a pipe dream. So by day, Mingiedi Mawangu made a living driving a truck. At night, he played the lukembe and dreamt of becoming a musician. Eventually, Mingiedi Mawangu realised that his only way of making a living out of music, was to form his own band. Soon,Konono Nº1 was born. Its members were drawn from the Bakongo ethnic group, which lives in a region that straddles the border between the Congo and Angola. However, by 1966, the members of called Konono Nº1 home. That’s where the orchestra began to make music. This wasn’t going to be easy. Money was tight, and the only instruments Konono Nº1 owned were a trio of electric likembés. To this, they added horns carved out of elephant tusks. This wasn’t an end to orchestra’s D.I.Y. approach to music. Without the money required to buy amplifiers, Mingiedi Mawangu decided the orchestra should make their own. So they headed to a local junkyard, and found the parts required to make basic amplifiers and speakers. Now, Konono Nº1 could begin to make music. The starting point for Konono Nº1 was Zombo ritual music. It was combined with elements of Congolese and Angolan musical. This genre-melting sound proved a potent and intoxicating brew. Especially when augmented by a rhythm section and myriad of percussion. Soon, Konono Nº1i were a popular local band. Over the next twelve years, Konono Nº1’s popularity grew. So it was no surprise that in 1978, they were asked to record a track for the compilation album Zaire: Musiques Urbaines a Kinshasa. For the orchestra, this was a huge honour. However, they had never recorded a song before. The song that Konono Nº1 chose was Mungua-Muanga. They recorded the song, and continued to play live. Little did they realise that this song would influence another generations of musicians .Mungua-Muanga would the only song Konono Nº1 recorded for over twenty years. Fast forward to 2000, and producer Vincent Kenis just happened to be in Kinshasa, headquarters of Konono Nº1. Vincent was walking through the dusty streets of Kinshasa when he heard the familiar strains of Konono Nº1. Instantly, he was transported back in time. The last time Vincent heard them, was on a French radio broadcast. That was in the late eighties. Despite this, Vincent Kenis was sure that he was listening to Konono Nº1. So he went in search of the music. Eventually, he traced the music source. It was be’ing played on a beaten up cassette recorder. Excitedly, Vincent Kenis asked the owner about the elusive orchestra. He replied that: “they would be back from Angola soon.” Suddenly, Vncent Kenis’ joy turned to disappointment. It was a case of so near, so far. Soon, turned out to be six months. That was when Konono Nº1 reappeared. They contacted Vincent Kenis, who promised himself he was going to record Konono Nº1. He kept that promise. Before that, Konono Nº1 entered the international stage for the first time. This came in 2003. By then, it had been thirty-seven years since Konono Nº1 had ben formed. They had never played outside of their home country. However, in 2003, However, in 2003 Konono Nº1 made their international debut, opening for The Ex. A year later, Konono Nº1 released their debut album. Producer Vincent Kenis was determined to record an album with Konono Nº1. He was as good as his word, and Congotronics was released on Crammed Discs in 2004. Congotronics launched Konono Nº1 career internationally. Suddenly, they were touring North America, Europe and Japan. By then, Konono Nº1.’s first live album Lubuaku had been released in 2004. It however, wouldn’t enjoy the same success as Konono Nº1’s second live album. In 2007, Live At Couleur Café was released on Crammed Discs. It was an intoxicating reminder of Konono Nº1 live. So thought the judges of the 2008 Grammy Awards. Live At Couleur Café was nominated for, and won a Grammy Award. This lead to some of the biggest names in music wanting to collaborate with Konono Nº1. By then, Konono Nº1. had already collaborated with Bjork on Earth Intruders, a song rom her 2007 album Volta. However, in 2010, Konono Nº1 were asked to collaborate with Herbie Hancock on Imagine from his album The Imagine Project. Konono Nº1. joined Jeff Beck, Pink, Seal, India Aria and Oumou Sangaré. This star-studded lineup reinvented John Lennon’s classic Imagine. It was an exciting project for in what was a busy year for them. In May 2010, Konono Nº1 released their new albumin Assume Crash Position on Crammed Discs. What was the latest instalment in the Congotronics’ series, was released to critical acclaim. Then six months later, Konono Nº1 featured on Tradi-Mods Vs. Rockers: Alternative Takes on Congotronics, a homage to the Kasai Allstars. This rounded off a busy year for Konono Nº1. After one of the busiest years of their long and illustrious career, Konono Nº1 picked up where they left off in 2011. Still they found time to take part in the Congotronics vs Rockers project. It featured collaborations between ten Congolese musicians and ten indie musicians. The result was a fascinating series of collaborations which won praise and plaudits from projects. So will Konono Nº1’s latest collaboration . Konono Nº1 Meets Batida was recently released by Crammed Discs. This is the first Konono Nº1 album to be released since the death of Konono Nº1 founder Mingiedi Mawangu last year. His son Augustin Mawangu is now the band leader, and has been for several years. He lead Konono Nº1 during their recent collaboration with Batida. Pedro Coquenã a.k.a. Batida was born in Angola, but was brought up in Lisbon. He’s not forgotten his roots though. His alias is a nod to the pirate stations that can be heard across Luanda, the capitol of Angola. These pirate stations also influenced Batida’s two, genre-melting studio albums. Batida released his eponymous debut album on Soundway, in 2012. A year later, he returned with Dois. It was also released to critical acclaim, and was heralded as a game-changer of an album. Never again, would African electronic music be the same. This was high praise indeed. However, word was spreading about Batida. Apart from receiving praise and plaudits from critics, some high profile musicians had heard Dois. They were impressed, and Stromae, invited Batida to open for him on his tour. Then Blur frontman Damon Albarn invited Batida to take part in the Africa Express project. This resulted in Batida remixing one of the tracks. It was an exciting time for Batida. Then came the chance to collaborate with Konono Nº1. When the chance to collaborate with Konono Nº1 arose, Batida knew the very place to record the album. It wasn’t in Kinshasa, Konono Nº1’s hometown. Instead, Konono Nº1 would come to Portugal. Batida didn’t have one of the city’s top recording studios in mind. Instead, Konono Nº1 Meets Batida was recorded in Batida’s garage turned studio. This was an unlikely place for a Grammy Award winning band to record. When recording of Konono Nº1 Meets Batida began, a number of Lisbon’s top musicians were going to feature on the album. They were representative of Lisbon’s cosmopolitan and vibrant music scene. This included guitarist Papa Juju, of Lisbon’s top Afro-Fusion band Terrakota. Another guest was vocalist Selma Uamusse, who is regarded by many as one of the finest young African singers living in Portugal. The final guest was MC AF Diaphra, an artist, producer and slam poet. It was a captivating cast of characters that gathered in the Lisbon garage, turned recording studio. Bringing together this marriage of electronics beats and African organic grooves wasn’t going to be easy. The responsibility fell to two men, Pedro Coquenã and producer Vincent Kenis. He had been with every step of Konono Nº1’s recording career. This project was different from everything that he had overseen. It was going to be a musical roller coaster. And so it proved to be. Two generations of musicians, plus three guest artists were collaborating on what can only be described a captivating, genre-melting project, Konono Nº1 Meets Batida. It’s full of surprises aplenty. Nlele Kalusimbiko opens Konono Nº1 Meets Batida. Straight away, two musical cultures collide. Konono Nº1’s traditional instruments, including their electric likembés sit atop pounding, electronic beats. Meanwhile, a myriad of galloping percussion is joined by Papa Juju’s searing guitar. As it cuts through the arrangement, cymbals hiss and crash. Soon, Augustus’ vocal enters, and is accompanied by joyous harmonies. Instruments flit in and out, including a tam tam and oil drum. Later, MC AF Diaphra makes a guest appearance and delivers an earnest, dramatic rap. Behind him, drums pound, percussion gallops and a droning sound adds to the drama. So do the crashing cymbals. Later, the tempo rises, and band reach even greater height as this irresistible sounding track reaches a crescendo. There’s almost a party atmosphere to this joyous sounding eight minute epic. Pauline Mbuka Nsiala wrote and takes charge of the vocal on Yambadi Mama. Before that, Konono Nº1 unleash their traditional percussive delights. Adding a musical contrast are mesmeric electronic beats. It’s an unlikely marriage, but one that works well. They’re a responsible for an almost hypnotic backdrop. This sets the scene for the vocal. The only word to describe the vocal is impassioned. Harmonies accompany the vocal, while drums and percussion become one. When the vocal drops out, it’s all change. Batida adds droning and futuristic synths. At one point, the arrangement is stripped bare, and his synths take centre-stage. Gradually though, the arrangement rebuilds on this genre-melting track. There’s almost an understated and traditional sound to Tokolanda.. Konono Nº1 combine likembés with a tam tam, percussion and rumbling bass. Guest artist Papa Juju adds a chiming, chirping guitar. It sits nicely in the mix, and doesn’t over the rest of the arrangement. That’s important, as the vocal is about to enter. With the bass underpinning the arrangement, the vocal is sung in a call and response style. Then a roll of the drums signals the vocal is about drop out. All that’s left is the exotic array of percussion, rolls of drums, the guitar and bass. As harmonies briefly enter, whistles blow and add to the carnival sound. Later as the tempo rises, Konono Nº1 deliver a musical masterclass, before the track reaches a joyous crescendo. Bom Dia features another of the guest artists, Selma Uamusse, an African vocalist who lives in Lisbon. She joins Konono Nº1 as they sing unaccompanied by just handclaps and a smattering of percussion. Augustin takes charge of the lead vocal, while the rest of Konono Nº1 add harmonies. Soon, though Selma Uamusse is making her presence felt, combining power and emotion. It’s an impressive sound. Then at 1.33 thunderous drums enter. They pound, and provide the backdrop for Konono Nº1 at their most impassioned, melodic and soulful. An array of traditional African instruments open Kinsumba. They transport the listener back to Kinshasa, in the Congo. That’s until the drums enter. They’ve a much more moderne sound. However, they provide the arrangement’s heartbeat, as the vocal is sung in a call and response style. Sitting below the drums, is the bass. It underpins the arrangement, as Augustin vamps. Then at 3.00 it’s all change. Effects are added to the vocals, and they become echoey and dubby. The drums and bass distort as whistles chirp. It’s as if Lee Scratch Perry has made a guest appearance. A scorching guitar cuts through the arrangement, as the bass and percussion propel the arrangements along. It’s a been a roller coaster ride with surprises aplenty in-store during an innovative, genre-melting track. Nzonzing Família is the longest track on Konono Nº1 Meets Batida, lasting over eleven minutes. This affords the opportunity to experiment. So a sample of Ikonoklasta’s track Cuka sits above an arrangement where traditional African percussion and electronic beats unite. The percussion is played with an urgency. Gradually, the tempo rises, matching the drama in the sample. When it no longer plays a starring role, this leaves the stage set for the drums and this delicious array of percussive delights. They combine to create a mesmeric backdrop, as the snippets of the sample flit in and out. This works well, and adds to the irresistible dance-floor friendly sound where the music of two continents unite successfully, to create the music of tomorrow. Just drums play before percussion and Augustin’s vocal enters on Kuna America. Soon, he’s joined by the bass, while harmonies respond to his call. Later, stabs of organ punctuate the arrangement as the bass, pounding drums and crashing cymbals drive the arrangement along. Then a stunning solo on the oil drum takes the track to a new level. After this, the vocal returns, and again, is sung in a call and response style. By then an exotic array of instruments flit in and out, tantalising and assailing the listener. Later, a synth beeps and squeaks. However, it’s the percussion that takes centre-stage and steals the show. It powers what’s the best track on Konono Nº1 Meets Batida along, until it reaches a hip swaying crescendo. Um Nzonzing closes Konono Nº1 Meets Batida, and features a sample from a Batida track Buntu. That’s still to come. Before that, a joyous selection of chattering, galloping percussion joins drums and a dark, moody bass. They sit well together, and provide a joyous, celebratory sound. They’re soon joined a bistering guitar and the sample. It adds a hypnotic sound, as Batida almost chants “Bantu.” Around him, percussion envelops the arrangement, and along with the rest of Konono Nº1 adds to a memorable, mesmeric and melodic backdrop. So good is Um Nzonzing that it leaves you wanting more. Sadly, Konono Nº1 Meets Batida is over, until hopefully, the next time. Angola barn Batida is the junior partner, and is one a new breed of producers, who over the last few years, has been combing electronic beats with African music. His two albums have been released to critical acclaim and Dois was hailed a game-changer. Meanwhile, Konono Nº1 are musical veterans, who have been around for fifty years. For most of their career, Konono Nº1 never left Kinshasa. That was until producer Vincent Kenis got involved. Vincent Kenis helped Konono Nº1 get established on the world stage. He also has produced each of their albums. This includes Live At Couleur Café, which won a Grammy Award in 2008. In the space of just a few years, Konono Nº1 had gone from playing clubs in Kinshasa, to rubbing shoulders with the great and good of music. This included Bjork, Herbie Hancock, Oumou Sangaré, Seal, and India Aria and Pink. Further collaborations would follow, on tracks for the Tradi-Mods Vs. Rockers: Alternative Takes on Congotronics, and Congotronics vs Rockers projects. However, still Konono Nº1 had to collaborate on a whole album. That was until they met Batida. 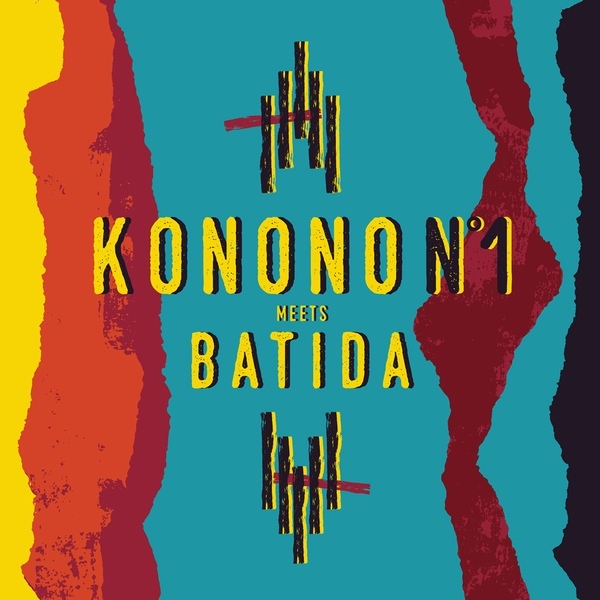 Konono Nº1 Meets Batida was recorded during 2015, and is the first album to be released since the death of founder member Mingiedi Mawangu. His son Augustin now leads Konono Nº1, and has done so, for several years. While he has a lot to live up to, Augustin played his part in what’s a captivating and memorable collaboration, Konono Nº1 Meets Batida which was recently released on Crammed Discs. Describing Konono Nº1 Meets Batida in just a couple of words is impossible. The music veers between joyous and irresistible, to melodic, memorable and mesmeric as musical genres melt into one. Traditional Congolese and Angolan music is combined with electronic beats and elements of dub, gospel and soul. At the heart of Konono Nº1 Meets Batida’s success is an exotic array of percussive delights and vocals that are impassioned, heartfelt and joyful. The final piece of the jigsaw was a trio of truly talented guest artists. This was the recipe for a successful and intoxicating musical collaboration…Konono Nº1 Meets Batida. It’s a fitting way to celebrate the memory of the man Mingiedi Mawangu, who founded Konono Nº1 fifty years ago, in 1966. ← KINKED! KINKS SONGS AND SESSIONS 1964-1971.